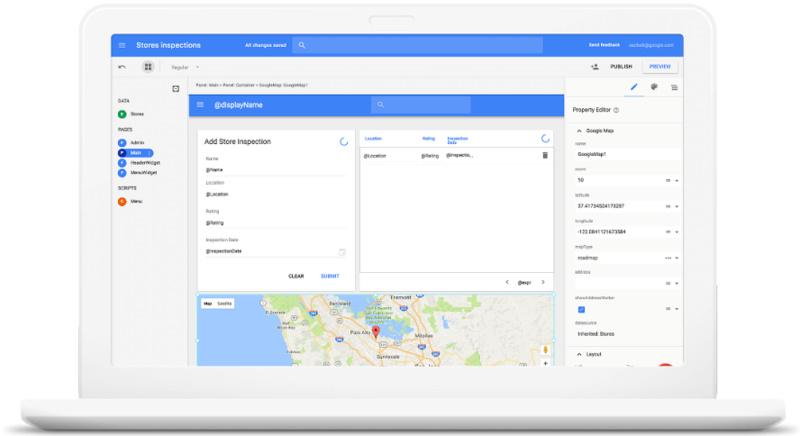 low-code application development tool that lets your organization build and deploy custom apps easily and securely, on the same platform that powers G Suite. It’s able to connect to API’s easily. Connecting with a vast amount of API’s gives you the possibility to connect your application in an easy manner. Whether it’s weather data you need or a location on Google Maps. Let your app create new data, or import the data you already have. Store that data in your Drive or on Google Cloud Platform. Finally a way to improve old custom made code. Many organization face the same problem: a large amount of custom made applications that has been growing throughout the years. Think of applications for simple workflows, processes or ticket handling. All originated in legacy Sharepoint, Lotus Notes or Microsoft Access environments. Until now it was hard to take these applications to the cloud. With Google App Maker it is relatively simple to get these applications to a modern platform. We’ll tell you more about this in a later blog post. Everything is hosted on the Google platform. The infrastructure Google supplies is proven to be stable and scalable.. Quickly deploy your app to the entire company. No servers, administrators, or provisioning required. Only limited knowledge of scripting is required. It’s even possible to build some basic applications without knowledge. But with the low level Google Apps Script this creates even more opportunities for you. With built-in templates and an intuitive UI editor, App Maker makes it easy for anyone to build sophisticated user interfaces. Google already has some great samples available. A range of samples is available here. These range from registration forms, a forum or even a calculated model. These samples give you some great insights in how App Maker works and can help you get a headstart on creating or expanding your own application.